When I accidentally came upon the Neville Roller Drome, which sits unassumingly at the end of an industrial road on Neville Island, I immediately wanted to share it with everyone. There is so much of the American experience that I see reverberating off the orange and yellow walls of this place, so many stories within stories carried through its doors, and a revolving cast of characters that make it easy to spend time there just listening and watching. This is a photo essay of some of those people. I believe we are a sharing species at our core, which is why showing each other photos is so appealing to many of us. We find a powerful moment, interesting person, or special place, and we want to turn and immediately tell our friends about it. The desire and enthusiasm to share what we find is a trait I see in many photographers and storytellers I connect with. When I accidentally came upon Neville Roller Drome, which sits unassumingly at the end of an industrial road on Neville Island, I immediately wanted to share it with everyone. There is so much of the American experience that I see reverberating off the orange and yellow walls of this place, so many stories within stories carried through its doors, and a revolving cast of characters that make it easy to spend time there just listening and watching. There are rainbow lights, there are jars with pickles for sale, there are Sophie's homemade signs affixed at every turn. I met 70-something-year-old ladies in skating skirts waltzing around in the morning, cosplayers dressed as anime characters by night, and a whole team of fierce Derby Brats that seems to be there in some shape or form on most times the rink is open. And of course, there are Jim and Sophie, who are working every day towards their own American Dream to make the Neville Roller Drome the space and community they see in their heads and hearts. Emily Kuzma, 20, of Downtown, stands with her rental skates by the skate room window at Neville Roller Drome on Neville Island on Sunday, April 24, 2016. "We're trying to rebuild the skate community here in Pittsburgh," said rink owner/operator Jim Park, 53, of West View, a lifelong skater himself. This marks the fifth year under Park's ownership for Neville Roller Drome, the rink where his father first took him to learn to skate as a six-year-old. 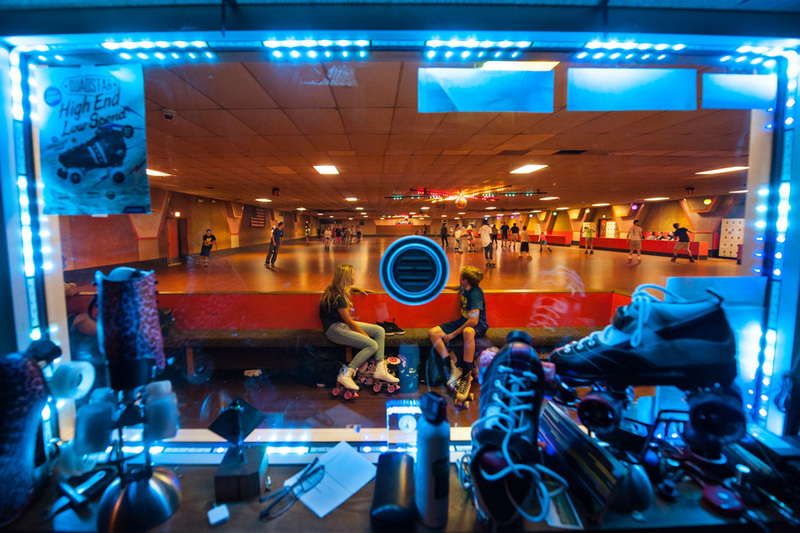 Lights illuminate skates for sale in the pro-room window as people make their way around the floor at Neville Roller Drome on Neville Island on Saturday, July 23, 2016. "We were kind of territorial of this place as kids," said Melissa Scalise, 38, of Freedom, who grew up in the on Neville Island and came often to the rink. "'The Island Kids,' they called us... Now we're bringing our kids." Skate clerk Katelyn Fowler, 18, of Sheraden, closes up shop at Neville Roller Drome on Neville Island on Wednesday, June 29, 2016. Fowler was part of the rink's junior roller derby team before she aged out and started college nearby with dreams of becoming a veterinarian. The team, the Pittsburgh Derby Brats, had four skaters in this year's junior olympics. 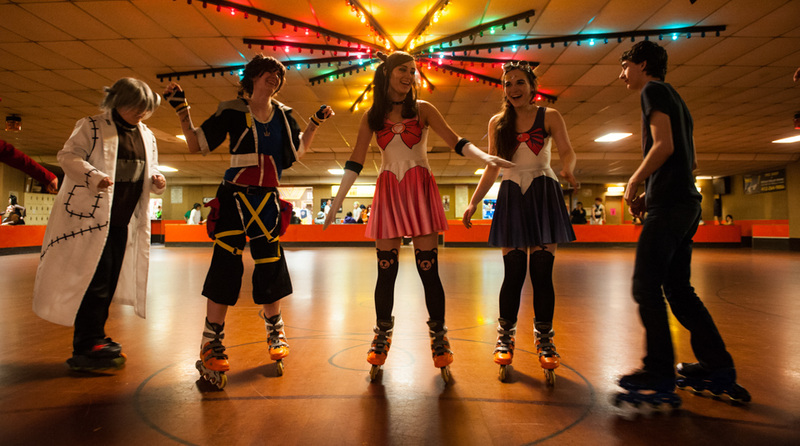 Michelle Manners, left, 20, of New Kensington, gets some help with her roller blades from Kelly Kagels, right, 27, of Ingram, as they suit up for a Cosplay Skate Party at Neville Roller Drome on Neville Island on Sunday, April 24, 2016. "When you come into Neville in particular-- whether you’re a novice or you've been skating, in my case, 47 years-- if you’re a dance skater, shuffle skater, speed skater, we don't care, we want you to enjoy your evening with us," said rink owner/operator Jim Park, 53, of West View. 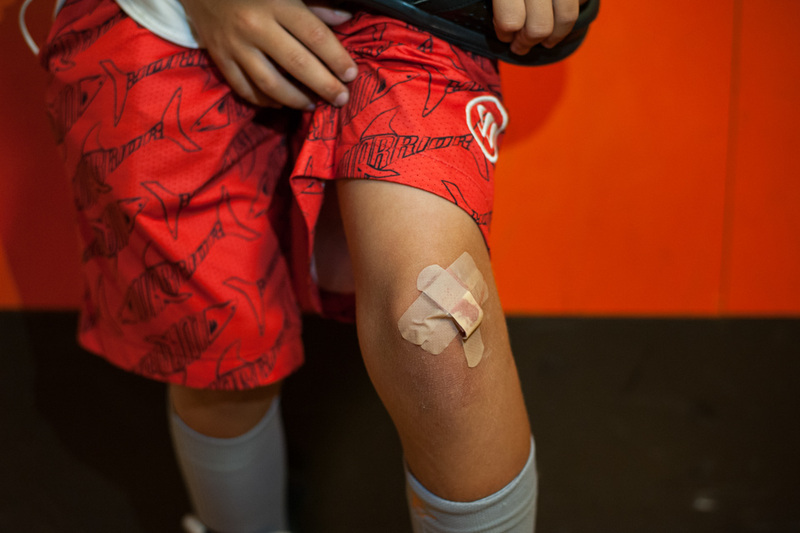 Jeffrey Hurst, 9, of Upper St. Clair, displays his bandaged knee for the camera after a spill at Neville Roller Drome on Neville Island on Saturday, July 23, 2016. "I also tell mom and dad, when they’re going, don’t make a big deal about it when they fall," said rink owner/operator Jim Park, 53, of West View. "Failure is an option. We fall. Okay, I messed a move up... Okay. Whatever. We’re gonna do it again. We don’t let the failure hold us down." 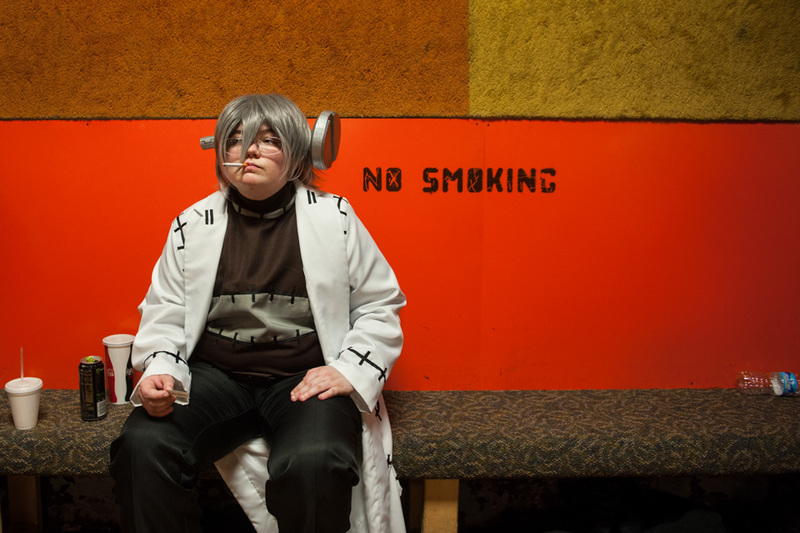 Darcy Mitchell, 25, of West Mifflin, chews on a fake cigarette that is part of her anime "Franken Stein" costume, as she takes a break from skating during the Cosplay Skate Party at Neville Roller Drome on Neville Island on Sunday, April 24, 2016. Rink owner/operator Jim Park, 53, of West View, seems to leave no skater without a proper welcome, giving skating tips to those who want them, or want to trade them. 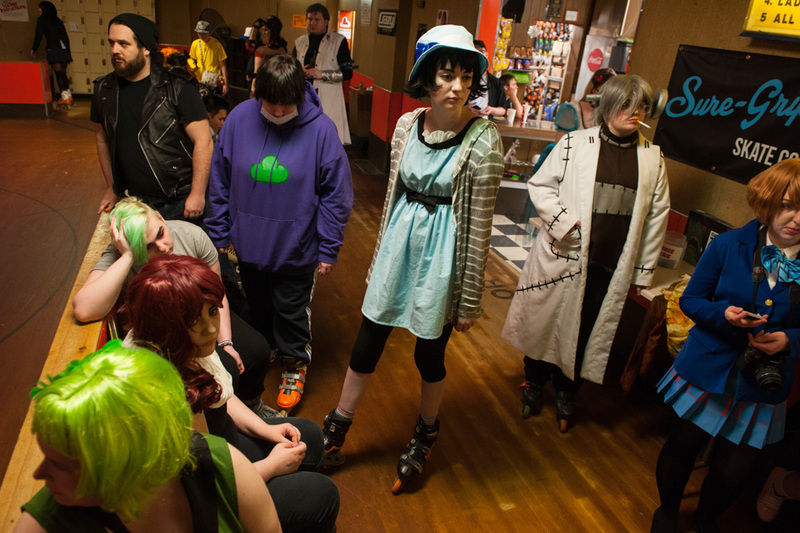 "For me, it was an excuse to come out here in my favorite cosplay and skate," said Mitchell, who said it was her first time skating in 15 years. People laugh together as they dance to "The Hokey Pokey" at the Cosplay Skate Party at Neville Roller Drome on Neville Island on Sunday, April 24, 2016. "I consider basically anyone who walks in these doors family," said Sean "Shaggy" McEachern, 20, of Rochester, who showed up at the rink to skate and hang out on his day off from working there as a rink guard. "I grew up in this rink, my parents actually met here," he said. 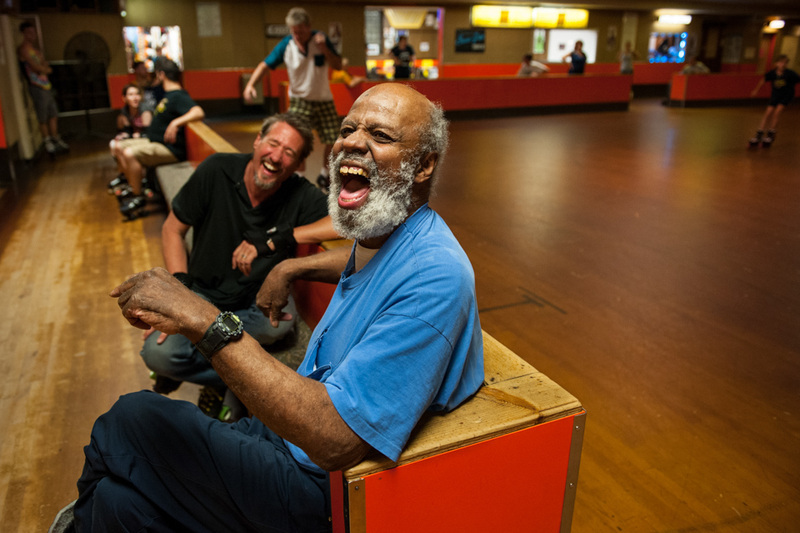 John "Big John" Cook, front, 72, of Homewood, laughs with Eric Mulvihilo, 47, of Ingram, as they take a break from skating at Neville Roller Drome on Neville Island on Wednesday, June 29, 2016. After one of his lungs collapsed, Cook's doctor said he would never skate again. "One of these days, I'm goin' back out," Cook told the doctor. Three years later, he stepped back into the rink. "I put my skates on and I went hay wild," he said. "I've been skatin' since." 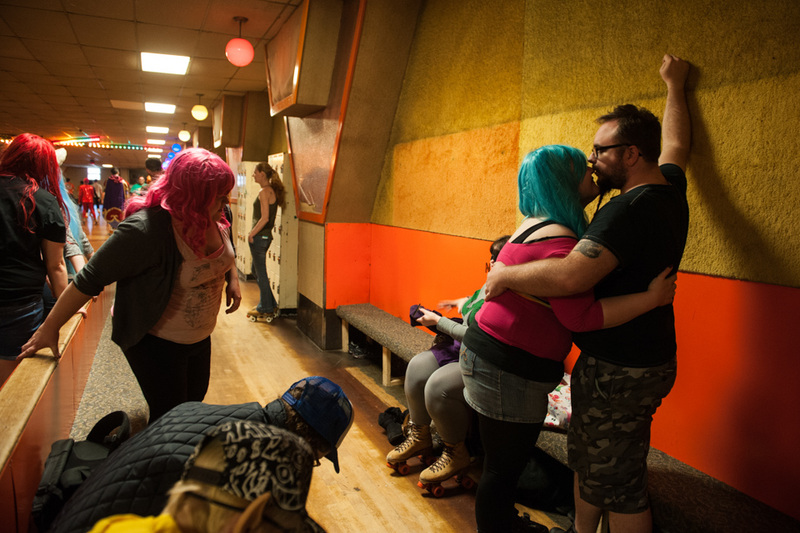 Leslie McCartney, 28, of Dormont, leans in to give a quick kiss to Pete Martin, 30, of Dormont, at Neville Roller Drome on Neville Island on Sunday, April 24, 2016. For some, skating and the rink provide a refuge and break from everyday life. "I had such a stressful day," said Eric Mulvittilo, 47, of Ingram, head referee for the Pittsburgh Derby Brats roller derby team that calls the rink home. "I was like, I need to skate."